A public meeting us being held in Cumbernauld Village Hall on Tuesday to discuss the possibility of creating a community-run animal collection. The meeting, which will take place, from 7.30-8.30pm, has been organised by Cumbernauld and Kilsyth MSp Jamie Hepburn and members of the Save the Animal Park At Palacerigg Country Park Facebook group. 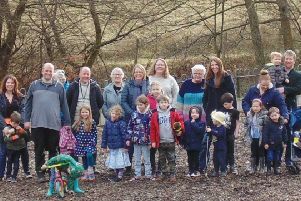 This follows the recent removal of an animal collection from Palacerigg Country Park as North Lanarkshire Council looks to save £69,000 – a move which has been met with public outcry and hundreds of residents have participated in protests at the park. Mr Hepburn said: “There have been a number of developments over the last few weeks that have been particularly disappointing, the hasty removal of the animal collection itself and the purported desire by the council to quickly remove the fencing and pens that the animals were housed in. To facilitate planning for the event, anyone interested in attending should email jamie.hepburn.msp@parliament.scot or contact the Save the Animal Park At Palacerigg Country Park Facebook group. The site where the animals were based is earmarked for a new play facility, which will cost around £300,000, and construction is expected to begin next month. The council is also holding a public consultation on the future of the park.